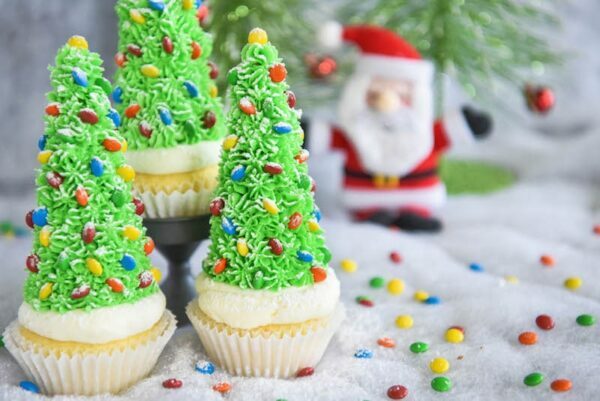 Christmas Tree Cupcakes: these festive Christmas decorated cupcakes are made with buttercream frosting, mini m&ms and hidden ice cream cones for the base! Every year I have to make some adorable Christmas treat, but even more so now that the girls are really getting into Christmas. They are at that perfect age where they are starting to understand and get excited. They have now helped decorate three actual trees (two at our house and one at the grandparents), are in love with Santa and think Candy Canes are the best thing on the planet. We are already on our third box of mini candy canes of the season. 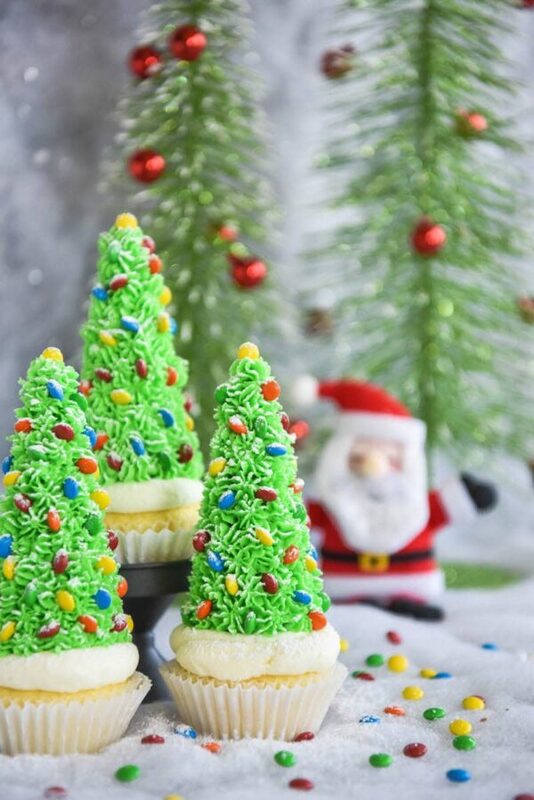 To keep the merriment going, I was thinking of making sugar cookies that we would roll out and cut out into trees and decorate. However, I wasn’t up for that much work. Decorating with royal icing is not my game and rolling out cookies is not something I do unless I have to. Cupcakes and buttercream, on the other hand, are totally my comfort zone. I used a sugar cone for the base of the tree to save a TON of buttercream and make it much sturdier. I still piped a regular white round of buttercream at the base of the tree for ascetics, practicality and flavor. 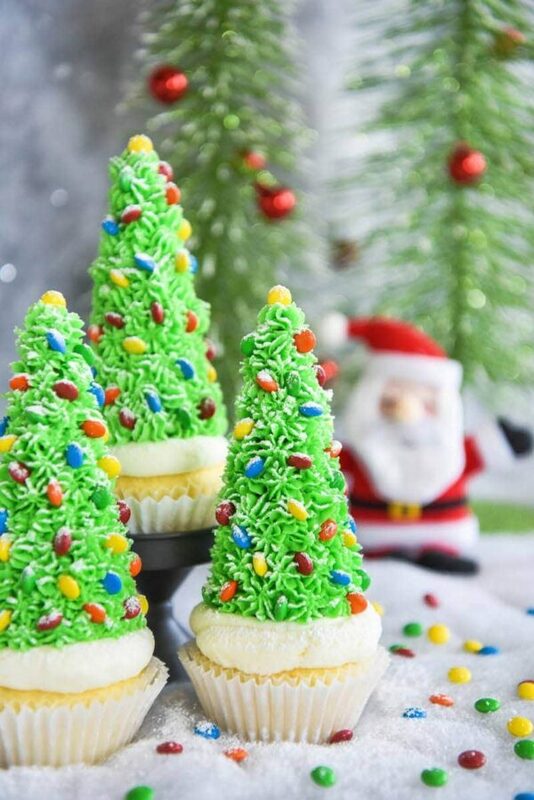 The white buttercream looks like snow, provides a base for the sugar cone and when people take the top cone off they still have a full cupcake to eat with frosting. Then I used mini M&Ms as the Christmas lights and I think they look perfect. I skipped the brown M&Ms, but used all the other colors. And to finish them off, we dusted them with snow — also known as powdered sugar. They turned out so adorable! Head on over to Dixie Crystals for the full recipe and instructions. 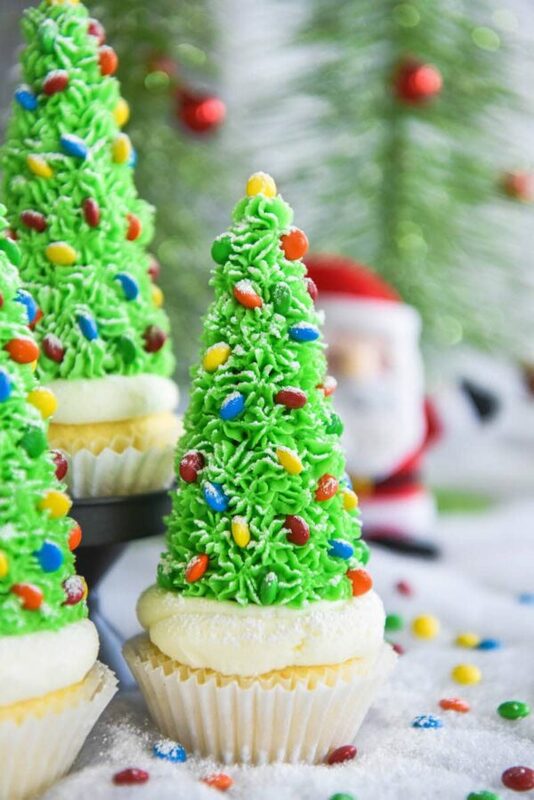 To make these cupcakes easier, you can use a boxed vanilla cake mix in place of the homemade cupcake recipe.